- Slips over the airplane tray, and secures with a velcro strap underneath. - Turns the tray table into a game board or white board, using the clear sleeve on the tray surface. 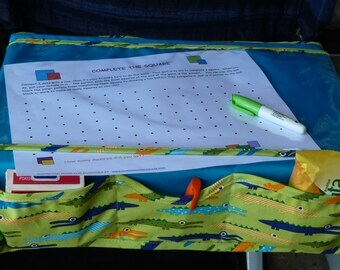 Just insert different activity sheets into this clear sleeve and play games with either dry erase crayons or markers. (NOT included with product- sorry!) Erase and play again! Check out our Activity Sheets! Etsy requires a price, which is why they cost 20 cents. Just email or convo me and I'll send them to you free of charge. - Small pockets in front to keep personal items handy while in flight. - A stretchy mesh pocket stores larger items like books, tablet, or travel pillow. - The clear sleeve on the tray surface is double-sided and can be pulled forward while you push the tray into the locked position, flipping over and hanging from the tray edge. Now you have a place to insert your electronic tablet to watch a movie or read a book hands-free while you fly! And the tray table is up, so you have plenty of leg space. The clear sleeve also prevents fingerprints on the screen, and the screen responds easily through the plastic. 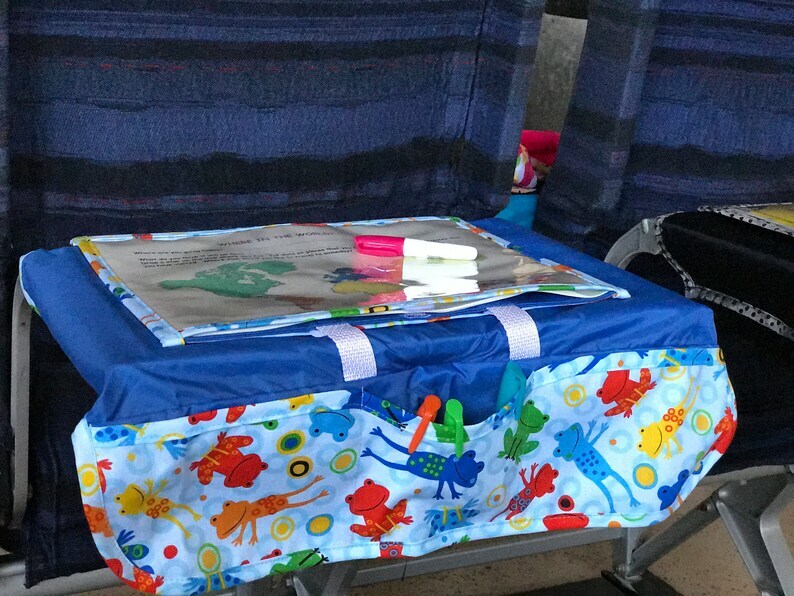 - Airplane tray cover can be folded and flipped into this clear sleeve for compact packing. - Please reuse the zip plastic bag it comes in to store when not in use.